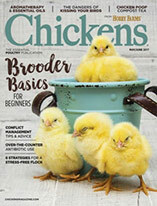 Across the country, city chicken regulations have countless variations, ranging from residents simply being allowed to have chickens to restrictions on flock numbers based on yard size. Some flocks can free-range, while others cannot (and some rebels do it anyway). Some cities require that each bird be registered like its dogs and cats. Some city residents can have roosters, but others cannot. Rita knows her rooster is unhappy, and she wants to know how to improve his circumstances within the confines of the law in her city. Because chickens are motivated almost entirely by food, food games are a great place to start. Hanging fruits and vegetables like a tetherball keeps chickens occupied as they try to eat the food as they bat it around with their beaks. Some people like to hide mealworms, nut butters or both in the creases of decomposing logs or in other hard-to-reach places. I’ve even seen people stuff dog toys with food treats for chickens to work for. 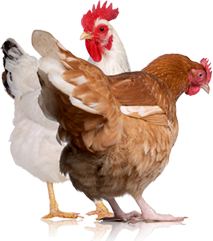 Scattering food to make chickens run is great fun for them, as are foods they can carry and play keep-away with, like bagels or burned toast. Providing a place for dust bathing and a high spot to roost are important, too. But, if a caged animal can do nothing but stand or sleep, he’s never going to live a happy life, no matter what entertainment you provide. Unfortunately, Mr. Rooster in Missouri has a more serious problem than lack of amusement. He’s living in a place where the laws allow his presence but appear to require substandard living conditions. Laws that allow us to raise chickens must include provisions or limitations to ensure the basic welfare of animals. Many of these laws consider the welfare of the surrounding neighbors only, but when laws neglect the basic welfare of the animals they allow, they create situations that can promote legalized abuse. A city should either outlaw roosters or allow roosters a similar lifestyle to the hens. Any chicken living in confinement should have a minimum of 4 square feet of space and no less. If that much space cannot be provided, ethically, the chicken shouldn’t live there. The more space chickens are provided within a safe environment, the better off they will be. Further, some breeds tolerate confinement better than others. 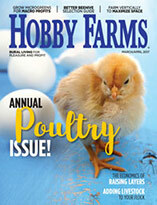 Consider a breed’s particular tolerance for confinement before ever raising chickens. Some breeds are much more independent than others and even scrappy enough to be all-day or full-time free rangers—these breeds would be incredibly unhappy cooped up 100-percent of the time, not to mention that caging would be completely inappropriate. One reason so many of us keep chickens in the first place is because factory-farmed birds are kept in cages or they’re raised “cage free” inside large outbuildings where they’re packed wing to wing, living no semblance of a chicken life. If the only choice in raising a rooster is confining him to a cage where he can’t satisfy any natural chicken behaviors, then that’s no life for him. How to entertain him goes far beyond food games—what’s best for him might be a new home. Anyone who raises animals needs to be very honest about the animal’s true needs and whether or not the owner can meet those needs.